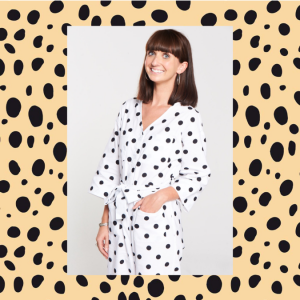 You will be able to meet Bethani and experience her stylist talents at Golden Square’s Lookbook Live on Saturday 8 and Sunday 9 September, where she will be talking shoppers through the upcoming autumn trends and how to pair them with what’s in your wardrobe. When did you become a stylist, and what is your favourite part? I’ve been styling for around seven years now. While studying fashion design at Leeds Art College, I interned for Britain’s Next Top Model and then London Fashion Week. I then went on to assist different stylists and my career grew from there. My favourite part about being a stylist is being able to work on a range of different projects and collaborate with different teams to create beautiful images. I love not knowing where I’ll be working from week to week. It keeps it really exciting! Can you talk us through your three favourite pieces in your wardrobe? My Cardinals vintage baseball jacket I bought when I was 18 in Camden, my ‘unsatisfied’ girls club t-shirt by artist Marcelina Amelia and my Vans trainers. What fashion accessory can’t you leave home without? Talk us through your go-to fashion stores and brands. My go-to online fashion brand is generally ASOS, as it has a range of amazing designers. Monki and Berska being my favourites! Store-wise it’s got to be Topshop and Urban Outfitters as I love retro sports brands and trends that tend to have more of an edge. What are your trends predictions for AW18? Definitely the cowgirl trend! We’re going to be seeing cowboy boots, fringing and lots of leather. Tell us what AW18 must-have you will be adding to your wardrobe. As I’m so excited about the upcoming cowgirl trend, I’ll be adding a snake-print leather jacket and/or cowboy boots. What AW18 accents will you be adding to your upcoming projects? I’m in the process of sorting out a few collaborations with graduate fashion designers that have specialised in leather, so it’s definitely going to be a massive addition in my styling this autumn! Can you tell us about some exciting projects you will be working on this season? Being a stylist, I mostly work week by week, so I don’t have anything definite booked in the diary. But I am currently styling for the very.co.uk autumn photoshoots, so I’m really excited to see how they turn out. 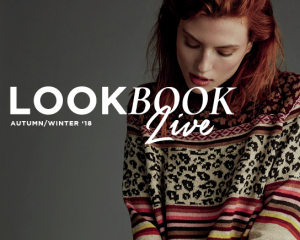 Check out the Lookbook live event on the 8th and 9th September at Golden Square.